It is finally done and I am blocking the quilt. I can now say that I did a large whole-cloth quilt! It is wet – that is why the picture looks so shiny. I have the backing and batting ready for my next project. I will be starting the quilting on my curve-pieced lily hopefully this weekend. 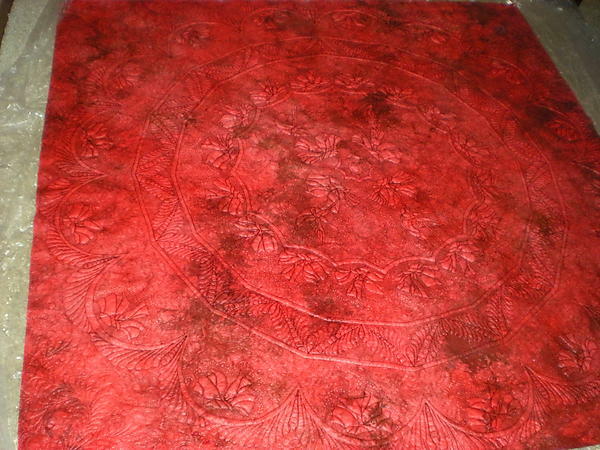 I am a little tentative about it because I bought a batik for the backing and a black polyester batting. I am following , “you never know until you try”, but this is really hard to do this on a contest quilt.